Create and print paper wallets for the safe long-term storage of your Bitcoin, Litecoin, Bitcoin Reference line and Reference line coin. If you store your coins on a paper wallet the coins cannot be stolen from your computer. Create and print paper wallets for the safe long-term storage of your Bitcoin, Litecoin, Bitcoin Reference line and Reference line coin.If you store your coins on a paper wallet the coins cannot be stolen from your computer. You can use Paper Wallets for a safe long-term storage of your coins.You can select the currency. 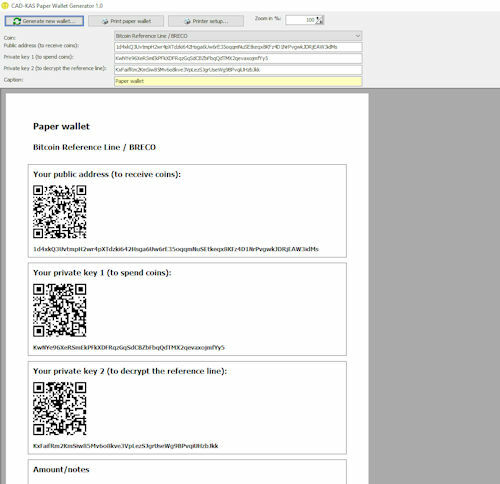 The program automatically creates a new paper wallet. You can then print the paper wallet. You can create a new wallet with one mouse click.The wallet has a public address which you can use to send coins to the wallet. And the wallet has a private key which is later needed to spend the coins.The wallet supports Bitcoin, Litecoin and also the Bitcoin fork Bitcoin Reference line and the Litecoin Fork \'Reference line coin\'.With Bitcoin Reference line you can send an encrypted text to the receiver of the transaction along with the transaction like \'Payment for invoice #123\'. CandleScanner is a technical analysis software package created for investors interested in Japanese candle patterns. What makes this application exceptional is that it has been specifically designed for the detection of Japanese candle patterns. Meta Trader Account Copier. The purpose of this software is to help traders, who use Meta Trader 4 trading terminal, in their routine work with trading signals. JPG To PDF Converter for Mac creates PDF documents fromJPG, TIF, PNG, BMP or GIF files that you select. Simply drag and drop your images and photos onto the application, and click Convert Now button to start the task.